“I’m head-over-heels for this charming, funny, romantic, life-affirming book.” —Becky Albertalli, New York Times bestselling author of Simon vs. the Homo Sapiens Agenda and Leah on the Offbeat The irresistible companion novel to the New York Times bestseller When Dimple Met Rishi, which follows Rishi’s brother, Ashish, and a confident, self-proclaimed fat athlete named Sweetie as they both discover what love means to them.Ashish Patel didn’t know love could be so…sucky. After being dumped by his ex-girlfriend, his mojo goes AWOL. Even worse, his parents are annoyingly, smugly confident they could find him a better match. So, in a moment of weakness, Ash challenges them to set him up. The Patels insist that Ashish date an Indian-American girl—under contract. Per subclause 1(a), he’ll be taking his date on “fun” excursions like visiting the Hindu temple and his eccentric Gita Auntie. Kill him now. How is this ever going to work? Sweetie Nair is many things: a formidable track athlete who can outrun most people in California, a loyal friend, a shower-singing champion. Oh, and she’s also fat. To Sweetie’s traditional parents, this last detail is the kiss of death. Sweetie loves her parents, but she’s so tired of being told she’s lacking because she’s fat. 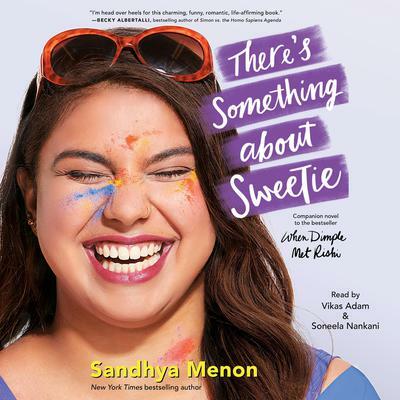 She decides it’s time to kick off the Sassy Sweetie Project, where she’ll show the world (and herself) what she’s really made of. Ashish and Sweetie both have something to prove. But with each date they realize there’s an unexpected magic growing between them. Can they find their true selves without losing each other? The irresistible companion novel to the New York Times bestseller When Dimple Met Rishi, which follows Rishi’s brother, Ashish, and a confident, self-proclaimed fat athlete named Sweetie as they both discover what love means to them. Ashish Patel didn’t know love could be so…sucky. After being dumped by his ex-girlfriend, his mojo goes AWOL. Even worse, his parents are annoyingly, smugly confident they could find him a better match. So, in a moment of weakness, Ash challenges them to set him up.